I reviewed Tidy Tots not that long ago. You can find my review here from April. Below are my pictures of what I had received and a bit about how they work. I received an essential set which has 2 covers, 4 inserts and 4 boosters as well as a PUL wet bag and 100 disposable liners. I got it in the Dino/Elephant. The inserts have a flap in the back so you can add a booster to it. Insert snaps inside the cover. On my 3 month old. The covers have a wonderful double gusset, so not only does this hold everything in, it also ensures a good tight fit on the thighs. The velcro tabs are very sticky, I have no worries that he'll be able to undo his diaper any time soon and they stay stuck to the laundry tabs during wash loads. The inserts are organic hemp and work well on their own or with the boosters. We use the boosters for optimum absorbency. I love that they are no fuss, stuff a booster in (or even just lay it underneath or on top), snap it in and you're ready to go. If the diaper has just been peed in, then just switch out the insert and create less laundry by getting 2 (or more) diapers out of just 1 cover. I also like that they automatically adjust in size to fit multiple size babies, so there's no snaps to deal with to adjust the rise. Perfect for using on 2 babies (like I have been with my 2 year old as well). That was my post from late April. I can say with 100% honesty, that I feel the same way! 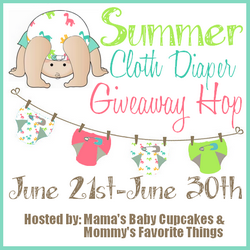 I LOVE using these diapers on both my boys, but mainly on my youngest. I have found though that it's not absorbent enough. I have super soaker babies and they don't last but 1.5 hours on my kids. Not a huge deal and I LOVE using the covers over fitteds and prefolds and then use the boosters with them for a bit extra. I really love using this system and will use it until my little potty trains! Price: $99.95 for the Essential Set and $98.95 for the NB set which is identical. 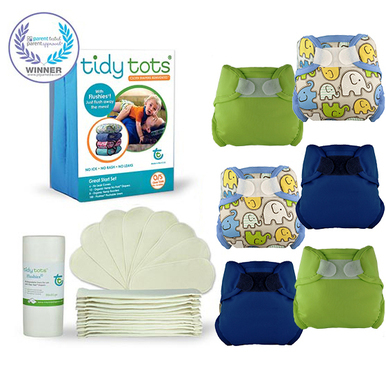 For the hop, Tidy Tots is offering one reader the chance to win a Great Start set which is a $269 package!! 12 inserts, 8 boosters, 6 covers and disposable liners!! It's a WONDERFUL starter set for getting into cloth diapering! I love that the inside is pul. im not so crazy about it being velcro. I prefer snaps to velcro. I've only ever tried pocket diapers but these look so cute and easy too!! Those inserts are the neatest things I have ever seen! I love that you can add a booster directly to the insert! The inserts are wild! What a neat concept. And then the covers are adjustable without snaps? Cool! I love the concept of this snap in AI2 system. And it was a genius idea to add velcro to hold the liners! I just wish it came in a snap closure. this system looks great. i love the gussets and the dino print! I love the prints! super cute! I'm loving that boy set for our little man!! The elephant cover is SO cute. I really like the idea of the no fold inserts. I like that you can stick a booster inside to adjust absorbency. The covers are really cute! Love that these would save laundry and that the inserts are eco-friendly..that is always a plus in my book! Not thrilled about the velcro because I would rather have snaps, but all in all they look like a great diaper! I love that elephant print! Love how the inserts snap right in and the elephant print is cute. I like that the booster goes inside... they look great! very intrigued by these - i love that the booster fits into the insert. i hate boosters that move/shift around. not thrilled at the velcro but i've found some good quality velcro that works for us so i'd be interested in trying these out anyway. i love double gusset covers. wish all covers had them! the prize is pretty good for the whole kit! I've been looking for a cover that fits well.... Maybe these are the ones! I'm intrigued. How do they adjust to any size without the rise buttons you see on most one-size diapers? wow those look like they would be great for my baby! I love how multi-functional these are, useful from baby to baby through their whole time in diapers. love the simplicity of these. such a unique design. love to try it out. I love to use covers and inserts, and that fold for the booster is awesome! I love the way the inserts snap in. Very nifty. I wish they came in snap closure though. I love that the inserts are organic hemp! Very cool! I would love to see a snap cover from them too! Love the organic hemp inserts. I try to stay to natural fibers for my little one. Cute prints! The insert design is really interesting! that snap in insert design is a great idea!!! i love that it gets covered over! Love the design of the inserts looks so easy! So cute and easy! I am gifting a set of Tidy Tots to a friend who is due this September! I love the snap in inserts and the prints are adorable . I would love to try these.